overpaid athletes and celebrities who get exposed for their massive shortcomings. And in his case, it’s unfortunately his ability to play the position he’s been paid millions of dollars to play. You can generally learn to stop sexually assaulting people in bathrooms, but poor Timmy’s got a mountain of incompetence to climb. One of the Lions defenders said he was bored during the game last week. 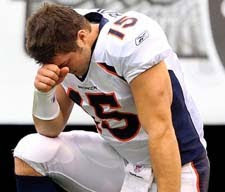 In reference to his skill level at the quarterback position, Merril Hoge said, “it’s never been this bad.” Hopefully for Tebow, the greater public will still be too busy making fun of his religious posturing to concentrate on his lack of talent. Surprising Stat of the Week: OK, how many of you watched draft day and thought that Cam Newton was going to be a fun toy and would sell tickets, but would ultimately just be a punchline? Me too. And right now, he’s 2nd in the league in passing yards and tops the charts in fantasy points. He’s also on pace for 4,786 passing yards. The rookie record, set by Peyton Manning in 1998, is over 1,000 yards less than that. And somehow they’re only 2-6. Bonehead Play of the Week: It’s not often that I pick on the Patriots for doing anything stupid. So you’re in for a treat. New England was down 13 points to the Steelers when Rob Gronkowski scored with 4:11 left in the game. Only the refs didn’t call it that way. Instead, the ball was ruled down on the one-yard line. I can understand the idea behind just lining up and trying to punch it in, since they had another couple downs to play with. BUT, once they ran the play clock down to 4 seconds getting the next play in and thinking about it, the risk/reward decision swung heavily back to throwing the challenge flag. Because if it held up, all that time would go back on the clock. They did indeed score with 2:35 left, but trying to mount an 80-yard drive with 19 seconds left is a little more difficult than doing it with 2 minutes left. It’s worth potentially wasting a time out, bonehead. Hard Luck Team of the Week: The Colts are the hard luck team of the season. But I’m not sure even Peyton could have saved this team. Last I know, he didn’t punt the ball. However, Miami wins this award for the second week in a row. They looked poised for a huge upset and even went for it on 4th and goal in a “why the hell not?” move and made it, putting them up 14-3. But once again, they squandered it in the fourth quarter, snatching defeat from the jaws of victory. Boneheadier Play of the Week: The Chargers are finding new, creative ways to lose now. In the “did that really just happen” department, Phillip Rivers dropped the center/quarterback exchange in the final drive in which they only needed a field goal to win. Oops. It’s kinda hard not to blame that one on you, Phil. Cry me a rivers.